An exceedingly simple design in stark white ceramic, yields remarkable versatility for placement in a wide variety of settings in these sleek demilune wall planters. The elegant, spherical half-bowl shape gives these planters a modern look, perfect for adding plant accents to both indoor and outdoor spaces in home and commercial settings. At nearly 12 inches in width, these planter bowls offer ample space for creative floral or succulent arrangements, while the short 4-inch profile keep them out of the way, allowing for several to be placed at intervals to infuse any space with plant beauty and color. **Official MyGift® product. ** Flowers and plants not included. SPECS: 4.5 H X 11.75 W X 4.0 D (in inches). 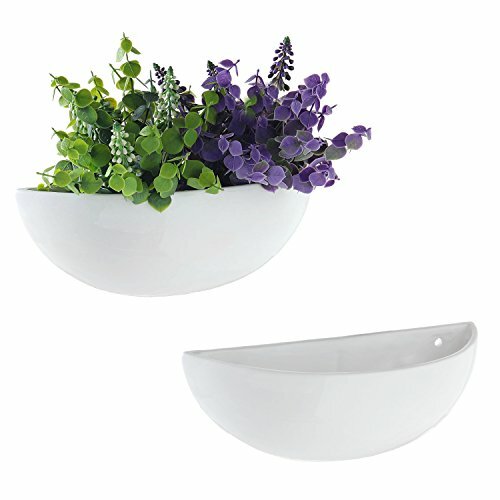 MODERN SIMPLICITY: white ceramic planter bowls in half-moon design. SPACIOUS DESIGN: 12-inch width provides ample room for creative floral or succulent arrangements. DECORATIVE VASES: a modern sphere-shaped design and white finish complements a variety of indoor and outdoor settings.